Capte o espírito marítimo de Belém neste passeio a pé de 3 horas, aventurando-se em torno de alguns dos locais mais conhecidos de Lisboa. Veja a famosa estátua de Vasca de Gama no Jardim Afonso de Albuquerque, bem como monumentos listados como Patrimônio da Humanidade pela UNESCO, como o Mosteiro dos Jerônimos, o Monumento aos Descobrimentos e a Torre de Belém. Junte-se a um pequeno grupo limitado a 6 pessoas para receber atenção pessoal e aprenda tudo sobre a Era da Exploração com o seu guia. Você tem uma escolha para passeios pela manhã ou à tarde para sua conveniência. O guia fornecerá informações sobre a Era da Exploração e a exploração portuguesa nos séculos XV e XVI. Conheça o seu pequeno grupo no Jardim Afonso de Albuquerque às 10 ou 15h e prepare-se para a sua aventura em Belém. Na praça pública, você pode vislumbrar a estátua de Vasca de Gama - uma homenagem ao primeiro explorador português a chegar à Índia por via marítima. Siga o seu guia por Lisboa enquanto ele ou ela lhe dá uma visão sobre a história da região, incluindo o seu papel nos séculos XV e XVI e a Era do Iluminismo, quando os portugueses foram alguns dos exploradores mais instrumentais do mundo. Você vai parar no Mosteiro dos Jerónimos - o primeiro local da sua viagem, tombado como Patrimônio da Humanidade pela UNESCO - e no Monumento aos Descobrimentos, que celebra os exploradores e marítimos de Portugal. Certifique-se de trazer algum dinheiro extra com você, porque o passeio termina em Pastéis de Belém, uma pastelaria local que tem mais de 100 anos de idade. Escolha produtos de padaria portugueses que você possa desfrutar no momento ou levar de volta ao seu hotel. 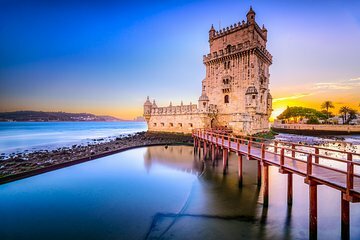 Seu passeio termina na Torre de Belém, um monumento listado como Patrimônio da Humanidade pela UNESCO, construído no século XVI. We were very late for the PM tour but RUI called and waited for us. Worth the walk and historical facts as well as the personal opinions. RUI knows the ins and outs of the place. Chiela, our guide, was an incredible highlight of our 2-week Portugal trip. We book tours every time we go on trips so we've had our fair share of tour guides. Chiela ranks among the best in terms of personality, helpfulness, attitude, knowledge, insights. She is attentive, responds very well to questions, knew a lot of material and content beyond the scope of the tour when we asked. She has a pleasant personality and made us comfortable, offered restaurant suggestions, and local recommendations, etc. It perhaps wasn't a busy day as our small group tour turned into a private tour for my wife and I only so perhaps we got lucky but also view this as this tour sticking to its commitment to hold the tour even though it was only for us two! Bravo, Chiela! We had a great time with you and again wish you all the very best! Excellent walking tour and guide! We had limited time in Lisbon before boarding our cruise and this tour was perfect. Our guide was professional and very knowledgeable. Highly recommend! Our guide was very knowledgeable. Good tour. Skip the pasteleria too busy. This was an afternoon walking tour. The morning one was fully booked. We are a group of 4 older folks and this was a private guided tour. Our tour guide, Rui Fernandes was prompt to inform us beforehand that he would like to conduct the tour half an hour earlier because the maritime museum just informed him that it is closing earlier that day. He came to our hotel to fetch us and went with us by metro to the normal meeting place for this tour. This was easier for us. We passed through the president's house, Jeronimos Monastery and the church next to it. This tour did not include a visit inside the monastery as time was limited. We spent a fair amount of time inside the Maritime Museum. Rui explained to us how Portuguese like Vasco de Gama did the expeditions in old days. Rui is very knowledgeable in Portuguese history and we learned a lot from him. Our last stop was at the famous Belem pastry shop where we all bought pastry to eat there and to bring back to the hotel. Our tour was in fact longer than the specified 3-hour. This tour exceeded our expectation and we would highly recommend Rui as a tour guide. Rui, of My Lisbon tours, Rui is extremely knowledgeable about the history of Portugal and all the details about Belem. There were only two of us on the tour and he tailored the tour to what was important to us. He knew the best times to go to the individual sites so we never waited on line. We could not have asked for a better tour or tour guide. As an aside, we just happened upon the Portugase President welcoming the king of Holland with a parade of bands, horses and soldiers. Rui did a fantastic job, had an amazing amount of historical knowledge. He was happy to set a slower pace for older family members and never rushed us. Loved the pastries! Rui is a terrific guide in a wonderful city. We took the Belém tour but if we had found him earlier we would have tried his welcome to Lisbon tour and his street art tour. Both would be a good time with such a knowledgeable and friendly guide. We were met at our hotel in alfama and walked to the train station to finally make it to Belém. Great sites and a well-curated experience that kept providing interesting history without overloading on museums. Be sure to wear comfortable shoes and dress for the weather. Our guide kept us hydrated and frequently stopped for shade on a hot day. Thanks Rui! My partner and I really enjoyed this 3-hour tour with Rui Fernandes. He's a knowledgeable young man who's very enthusiastic about the history of Portugal and its colonies, and can speak very intelligently about politics, economics, and current affairs. The tour doesn't actually take you into any of the magnificent buildings you see walking around Belem, except for the Mosteiro dos Jeronimos cathedral. And we felt that the Botanical Gardens could easily be skipped, as they are unfortunately not well maintained. But overall, it was a pleasant way to spend a sunny afternoon. This was a 2 to 1 walking tour by Rui Fernandes and it was 4 hours of magic, His love for Portugal , his knowledge of its culture, history and achievements shone.He was an outstandingly good guide, best we've ever had.